Outsourcing in the Vatican Pope Francis in search of the old men of the Curia. But how should they look like? Yet, there was a subtle debate behind the return to Latin America of the first Latin-American Pope. Behind the totem of a Latin American pope, an intellectual discourse is brewing to give legitimacy and new life to Liberation Theology. Even Leonardo Boff, one of the «fathers» of Liberation Theology, has inserted Pope Francis in its ranks, simply because he sees in the Pope the possibility of a de-institutionalization of the Church. In fact, Pope Francis is a conservative. More than de-institutionalize, he does not think much of symbols. History will judge whether this is good or not. On the other hand, that the Latin-American pope can be utilized to promote «theological warfare» is a danger that should not be dismissed lightly. It is worth noting that, perhaps, there was never really a war between Rome and Liberation Theology. Perhaps, ideology overshadowed reality, instigating conflicts were there were none. Conflicts that hid the truth. Can a friend of Liberation Theology be trusted? This was the insidious question raised right before Archbishop Gerhard Ludwig Müller was appointed the Congregation for the Doctrine of the Faith (CDF) prefect. Twice, unsolicited information about Müller was anonymously divulged via e-mail to some journalists who cover the Vatican. The second round of “leaks” was about Müller’s friendship with Gustavo Gutierrez, the “father” of Liberation Theology, and the honorary doctorate conferred on Archbishop Müller by the University of Peru, the very same institution from which the Secretariat of State recently took away the title of «pontifical» because of the university’s lack of adherence to Catholic doctrine. The re-publishing of the book has resurfaced some questions. Gustavo Gutierrez was for a long time under investigation by the CDF because of his book “Liberation Theology”, in which a particular theology is presented through a Marxist-type philosophy of history. Gutierrez was never admonished, as the Congregation decided that it was sufficient for him to make some slight changes to the book, mostly rewriting its introduction. Msgr. Müller is not concerned with any of this. He considers Gustavo Gutierrez a good friend, and still hopes to guide him into theological circles inaccessible to Gutierrez in the years Liberation Theology was intensely debated and contested. It seems that Müller has asked the Peruvian Bishops’ Conference to identify two Peruvian theologians to join the ranks of the International Theological Commission. It is almost certain that Gustavo Gutierrez will be one of those chosen, since there are very few actual theologians hailing from Peru. This way, Liberation Theology would have one of its representatives among the ranks of “official” theology. But can we really assume that the first Latin American Pope will shed light on that which is good in Liberation Theology, setting aside years of controversy? Then, the instruction laments that «faced with the urgency of certain problems, some are tempted to emphasize, unilaterally, the liberation from servitude of an earthly and temporal kind. They do so in such a way that they seem to put liberation from sin in second place, and so fail to give it the primary importance it is due». In essence, this discussion became an acrimonious debate in Latin America because of the harsh living conditions for the poor there. Liberation Theology came about in reaction to economic, social and political inequality in Latin American countries. In fact, there was a dialogue from the very beginning. In fact, this is a battle the Catholic Church has always engaged in, as stated in the Libertatis Nuntius (which includes a summary of papal encyclicals, documents and pronouncements on liberation and social justice). Liberation Theology came out of the very teachings of the Social Doctrine of the Church. It was just a matter of «re-balancing» some of its conclusions. It is the «demundanization» that Pope Benedict called for, in his speech in Fribourg on September 15, 2011. According to Müller, demundanization means «transform that which is not good, and then re-unite.» The two CDF instructions on Liberation Theology are part of this process. A process that found its closure in Aparecida, at the fifth general conference of the bishops of Latin America and the Caribbean, in 2007. The final document of Aparecida is one of the most quoted by Latin American bishops. 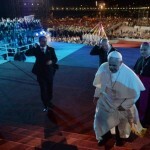 Pope Francis was one of the protagonists of the Aparecida conference. 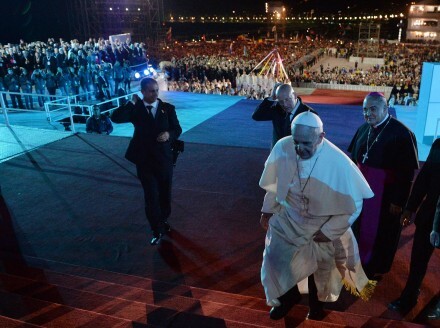 He mentions it very often – he did twice during this World Youth Day, speaking with bishops and with the CELAM committee – , and chose to give a collection of the conference interventions, as a gift, to Argentina’s president Cristina Kirchner. Yet, Gustavo Gutierrez’s new rise could also reignite debate over Liberation Theology. Pope Francis is being used as a tool to reintroduce the debate. But the Pope is not a Liberation Theologian. He is more someone in tune with the grassroots communities that originated in Brazil during the sixties. At that time, there was no hint of Marxism. It was later that theologians like Boff and Gutierrez learned about Marxism in Germany and brought to Brazil. It was a sort of colonization of thought, that still influences the debate.